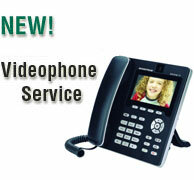 Now you can experience high-quality Video calls with any Service Plan simply by selecting either the Grandstream Videophone or the USB Memory Phone with Video softphone as your device. Click here for details. For information about our IP-PBX and SIP Trunking services click here.